Remote Solutions, LLC is based in Kotzebue, AK and provides leadership, project management, and design expertise to clients focused on bringing successful solutions to remote communities. Remote Solutions, LLC was developed to gather a team of experts that can support rural Alaskan communities in their efforts to become more independent and sustainable. Residents of rural Alaska are working hard to survive in harsh economic and environmental conditions. Community leaders must balance dealing with daily problems while looking to the future to find methods of averting crisis. Currently, and for the foreseeable future, rising energy costs are the single greatest limiter for business development, community sustainability, and a thriving economy. There is a vast need for technological solutions and services that can address these challenges. Remote Solutions, LLC is a service based company focused on providing quality skills to meet the needs of rural Alaska. Our background is variable and extensive, and we would like to work with community leaders to support existing efforts to thrive in this harsh, but beautiful environment. Specifically, our team can help create an action plan based on community visits and dialogue. Remote Solutions, LLC will work with teams to identify services and solutions that complement existing leadership styles. John Baker, Remote Solutions owner, is the 2011 Iditarod Champion and remains an influential role model throughout Alaska. Our team has expertise in renewable energy systems from feasibility to assessments. Remote Solutions can work with you to develop strategic plans, write grants, design websites, manage projects, and more. The owner of Remote Solutions, LLC, John Baker, has lived and worked in rural Alaska his entire life. "I have worked hard to build a dream and create hope for the people in my region. In 2011, my dream of winning the Iditarod came true and since then I have tried to spread my message of Dream, Try, Win as far as possible. I have had the great fortune of speaking to many groups of children and adults sharing Inupiat values of humility, cooperation, sharing, humor, and respect. 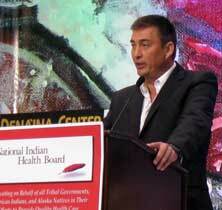 Last year I spoke at AFN and was honored with the recognition of being this year’s NANA Shareholder of the Year. That has humbled me greatly but there is more work to be done. I started Remote Solutions with the vision of doing all that I can to help build up rural Alaska to something every one of us can be proud of. I have brought together a group of like minded people who all feel passionately about this vision and I can’t wait to see what this team can do when working together with you."